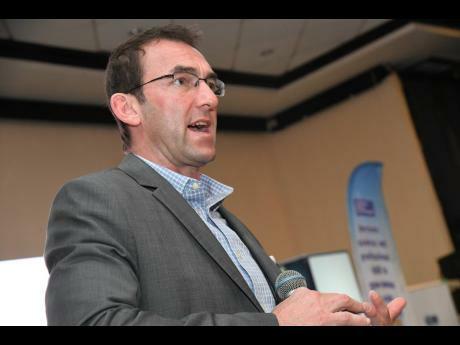 Professor Paul Riccomini of Penn State University, USA, speaks at the Mico International Mathematics Teaching Summit yesterday at The Jamaica Pegasus hotel. The two-day event is being held at The Jamaica Pegasus hotel in Kingston under the theme: ‘From Fear to Empowerment in Mathematics’, where the first plenary session was used to shed light on the obstacle and how to overcome through a change of approach by the parent, teacher and student. The session highlighted strategies and methodologies related to the psychological approach to the teaching and learning of mathematics, which will move students from the fear of mathematics to one where the subject is considered enjoyable, exciting and manageable. Penn State University Professor Paul Riccomini told delegates that the fear associated with teaching and learning mathematics is also a problem being faced for decades in the United States, even though there has been dramatic improvement over the last 20 years. “It is something that is very much a problem in the United States also; it’s something that encompasses everything that we do,” he said. Riccomini said that as Jamaica embarks on this initiative to promote and emphasise the importance of mathematics, it will have to deal with several issues such as assessments, anxiety and stress at the student, teacher and parental levels. “Children are not born fearing maths; they learn that. But where do they learn it from? They learn it from several areas. The first is at the home, so if parents have negative feelings towards mathematics, that will project on to the children. It is the first major obstacle, and it’s something that’s accepted in the main, but which has to be addressed. Mathematics is important, but do not try to say it is easy, because it is not,” Riccomini stated. Not dealing with the fear issues, according to him, meant that children would eventually grow up with the fear of mathematics, and would also pass on that fear to their children, continuing the cycle. “So the big message about fear and anxiety over math is that it is a learnt behaviour and that the best way to combat fear is to make kids feel successful,” the professor stated, positing that it was also important for tutors to teach mathematics in ways that were practical for everyday situations. Antonia Cameron, of the Metamorphosis Teaching Learning Communities in New York, agrees that changing how the subject is taught is paramount to changing the fear factor in students, while urging teachers to become more engaged in one-on-one interactions to have a greater impact on the student. With the Primary Exit Profile now established as part of that direction to open students up to critical thinking in what is being termed the Fourth Industrial Revolution, changing the outlook on maths takes on even greater importance.